Maybe God made me a painter for people who haven’t been born yet. Vincent Van Gogh (Willem Dafoe) offers this explanation to his brother, Theo (Rupert Friend), when the two are discussing Vincent’s lack of commercial success in Julian Schnabel’s new film, At Eternity’s Gate. That type of dialogue can be problematic in a biopic. A character speculates on his future with the accuracy of an oracle while the audience nudges each other and thinks, He’s right. That’s exactly what happened. However in this instance, we believe that Van Gogh may have indulged in such musings to give himself the strength to continue to paint in the face of an indifferent public. Like any artist, he dreamed that one day his work would be appreciated. Many of the tropes from Van Gogh’s biography make an appearance in the film: his failing eyesight, cutting off his ear and giving it to a prostitute, his death that resulted from being shot by a pair of bandits. Thankfully, these plot points don’t dominate the narrative. The missing ear is signified by a bandage he wears during the second act of the film. We never actually witness the gruesome deed. Lesser biopics play like a series of vignettes stitched together with clumsy exposition. Appropriately enough, At Eternity’s Gate plays like an impressionistic rendering of Van Gogh’s life. The literal edges of the frame are blurred as we drift through his life. Director Julian Schnabel shot portions of the film with a pair of antique bifocals covering the lense. The resulting effect distorts color and focus. It’s an effective way of depicting Van Gogh’s defective vision. It also serves the dual purpose of illustrating Van Gogh’s growing mental illness. We see firsthand how the artist’s mind distorts his surroundings. Ironically, the boldness of his art resulted from his difficulties with his vision and his impaired perception. Willem Dafoe gives a brilliant performance that avoids the melodrama and histrionics that seem inherent in playing a tortured artist. His rendition of Van Gogh is that of a committed artist who didn’t understand why the public couldn’t see the value in his vision of the world. As he states in the film, There’s something inside me, I don’t know what it is. What I see nobody else sees. Dafoe’s performance conveys that drive, that need to connect with his subject matter and his audience. There have been countless films about artists and Van Gogh in particular: Lust for Life (starring Kirk Douglas), Pollack (starring Ed Harris), Frida (starring Salma Hayek), Mr. Turner (starring Timothy Spall) and even the 2017 animated film Loving Vincent. (My personal favorite is Nick Nolte as Lionel Dobie in the Life Lessons segment of Martin Scorsese’s 1989 anthology film New York Stories.) All of these films strive to depict painting as a kinetic activity with the artist giving birth to a new creation. At Eternity’s Gate steps back from the frenzy of creation and shows us an artist deep in thought, contemplating his legacy at the same time he considers his next brush stroke. In the first act of the film, Vincent spends time with Paul Gauguin (Oscar Isaac). Van Gogh’s colleague criticizes him for “overpainting”, for layering paint on top of paint. He laughingly states that Van Gogh is turning into a sculpter instead of a painter because his paintings are becoming three dimensional. 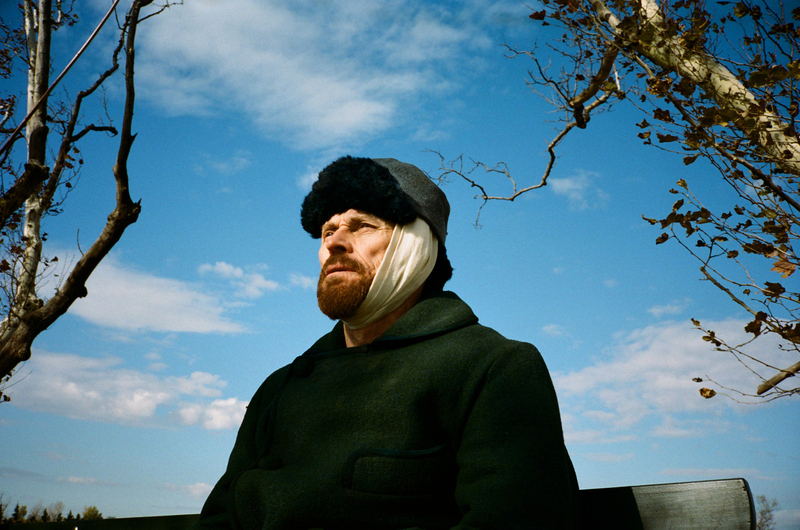 Ironically, but wisely, Julian Schnabel “underpaints” when it comes to At Eternity’s Gate. He gives his film room to breath. He chooses to tell his story visually rather than explain everything with dialogue. It’s an internal film that lives inside the mind of Van Gogh. Like the film itself, it’s a strange, but beautiful, place to be.